* With Tenacious Tape Neoprene Patch, fixing rips, holes and tears on anything made of neoprene is simple. Formerly known as Iron Mend, just cut patch to size and use a household iron to create a permanent repair to waders, wetsuits, boots and gloves. This iron-on fabric patch is useful for reinforcing seams and high-wear areas including elbows, knees and under arms. Its special lining also gives watersports gear that extra abrasion resistance to keep it looking good. 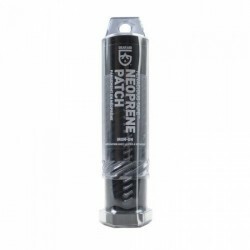 Use Tenacious Tape Neoprene patch to extend the life of expensive neoprene gear and accessories.